Afternoon light blazed unchecked over the grassy plains. On the horizon the snow-capped Wind River mountains gleamed. Beyond them, dark clouds gathered. The bikes were packed. A meal eaten. And the road ahead, unridden. 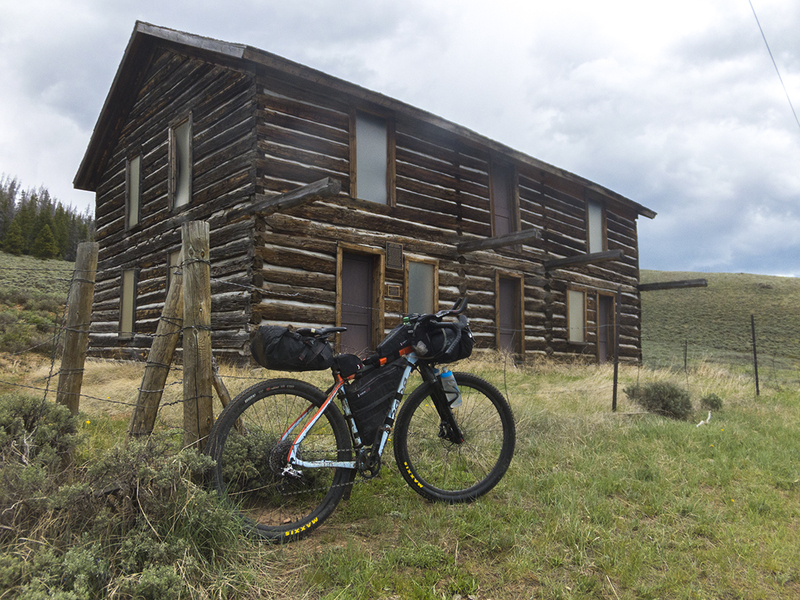 We left Pinedale, Wyoming–along with any sense of safe and secure–and set out on a week long journey to discover something about the Great Divide Mountain Bike Route. Of course, what I discovered had less to do with the ups and downs of the road, and more to do with my own personal demons. Demons that always prove far more wily than I ever anticipate. Rain spattered from the sky. Gray clouds smeared the peaks of the Wind River range. We were on a collision course with the storm. But, the route is the route. And the pink line on the GPS led us into the foothills of the mountains, and into the maw of the squall. “There is no such thing as bad weather” Jay Petervary once said, “only bad clothing.” We had good clothing. And the road was well-suited to the occasion, shedding water quickly. We rode through the gloom, praying for a change of course–either the storm’s, or ours. We banked southeast and for miles rode among the fringes of the clouds and the rain. We were riding through history. The South Pass area was a major vein of the westward trails. People seeking fortune, refuge, or both, traveled through these same rolling sage plains, underneath the same snowy peaks, and under this swirling stormy sky. They were constantly under threat. Bad weather could mean death. An Indian attack could mean death. Broken axles could mean death. But westward they went. Fame and fortune were won in these hills. But we weren’t looking for either of those things. We just wanted to see what was around the bend and over the hill. And what was over the hill? More hills. More sage plains. As far as the eye could see, the landscape did not change. The road rolled like a sawblade through the rumpled foothills. Long after dark we found a flat place among the sage and under the now clear, starry sky to sleep. We had ridden 66 miles. Up the road was Highway 28, and Atlantic City. And after that… the Great Divide Basin. I was optimistic. But lingering below that optimism I could feel the demons stirring. Pale light crept over the hill, making spiny silhouettes of the sporadic trees that lined the hilltops. A small herd of Pronghorn watched us from a safe distance, their curiosity besting their sense of danger. We packed our gear, rubbed the dirty sleep from our eyes, and set off once again. A sea of scrub and sage spread unending. The Wind River mountains faded into the horizon behind us. Trees became more rare, the horizon bigger. In the west we could glimpse the edges of the Divide Basin. Early morning light still hung in the sky when we rode through South Pass City. There were a few signs of life. But the small, historic outpost was mostly empty. We continued onward to Atlantic City. When we arrived, the town was dead quiet. The store was closed. The hotel was for sale. But we lingered anyway. Over the hill was the Basin. We were reluctant to leave the running water and shade of the evergreens. “It’s 100 miles to Wamsutter.” Ty said. 100 miles without shade. Without food. And only sporadic water. “Shouldn’t be too bad.” I replied. It was a statement of hope, more than fact. We climbed out of Atlantic City and abruptly, too abruptly, the forest disappeared. Before us lay an endless expanse of empty sage desert. In the distance, the road vanished over the tops of the rolling hills and dusty plains. The Divide route through the Basin intercepts the historic Oregon, California, and Mormon Trails. Concrete obelisks marked the paths. Here and there a signpost explained the significance of this or that. But the Basin is mostly empty, save for countless Pronghorn and herds of cattle. Fences ran in criss-crossed lines. Side roads wandered into unknown, but identical drainages, valleys, and plateaus. We stupidly (and unintentionally) rode past Diagnus Well. A mistake we’d pay for later. Herds of flighty wild horses danced around us. Stallions stared us down, warning us to move on. We happily did. The sun was a heavy burden on our backs. The road was marred with washboards and loose dust. I spend too much of my life thinking about the future. I worry about the unknown, and the could-bes. It’s no way to live. Not happily, anyway. Long bike races and bikpacking trips bring this futurism to full force. I question everything that I am, and everything that has brought me to these places. ‘Why am I here?” I ask myself. “What is any of this for?” I long to be a normal person, enjoying evenings in front of the television, fat, happy, and inert. 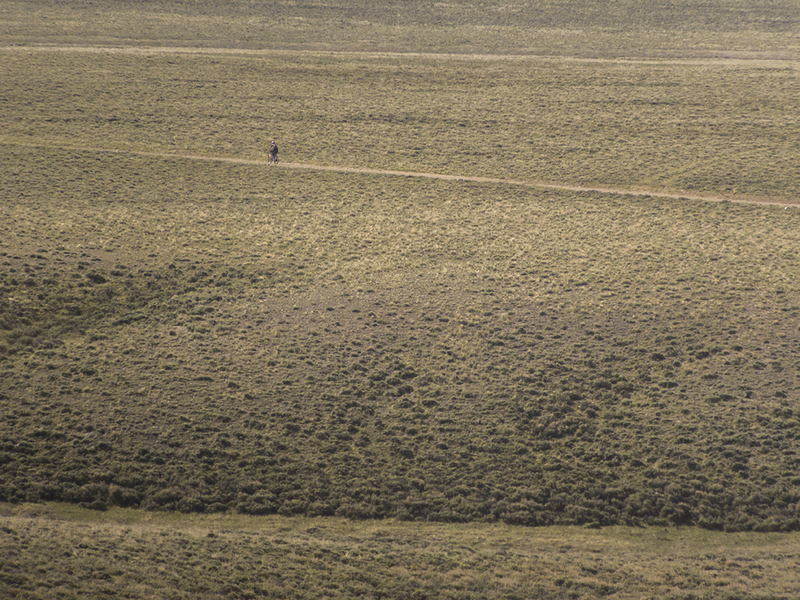 But away from the trail and the remote, empty uncertainty, I long to be on the bike. I pine for the deserts and forests, and the unridden road. If I am not careful, I end up continually unsatisfied, and unfocused on the task at hand. The crafty demons that conjure up these thoughts take great pleasure in the frustration this causes. They gloat with unchecked arrogance when I wallow in self pity. Doubt flows through my veins like a river of lies and deception. When I found Ty again, he was sitting in the rare shade of a rotted gas well. I joined him there. I was out of water. He filled half of a bottle for me from his cache. I dug into my bags, looking for food. “How you feeling?” He asked me. “Oh, I’m fine. Tired. I should have filled my bottles at the well, or at that running stream 10 miles back.” I had been a fool. Lesson learned. Don’t bypass water in the Basin. Ty rode away. I ate skittles in the shade. Wamsutter was 30 miles away. “That is not so far.” I thought. I swung my leg over the saddle, and pedaled through the sunny gloom. The closer to town I got, the more often oversized oil trucks rumbled by, spitting dust into the air. The truckstop was the greatest sight I’d ever seen. There were cars and people, so many people! And cold drinks, ice cream, and sandwiches. And ice cream sandwiches! Both Ty and I were exhausted. The Basin had been harder that we anticipated. The road undulated incessantly over rises and through gullies. It was not always smooth either. Washboards, sand traps, and rubble slowed our progress. The novelty of riding alongside galloping pronghorn had worn thin. The exaggerated emptiness of the place, once empowering, had become depressing. We made it to town, dry, hot, and covered in dust. It was not yet 7:00. But the peeling painted walls and the uncomfortable, undersized beds at the Sagebrush Inn were too much to resist. We took an early night, hoping to recover and regroup for the long miles ahead. The food, the shower, and the lazy evening put the demons at bay. For the moment. Freeway traffic hummed through town. Giant oil and gas trucks rumbled down the washboarded dirt roads. The truckstop lights buzzed in the night. Dark clouds dulled the pre-dawn light. A storm had rolled through. Rain and lightning filled the sky. I was glad to be under a roof rather than curled in a bivy somewhere along the route. As the sun rose, we pedaled along the soft gravel washboards south of town. Trucks barreled by, kicking dust into our faces. Pronghorn ran circles in the sage nearby. The wavy landscape was dotted with gas wells and drills that looked like boats at sea. For miles the road did not bend, climb, or descend. It was arrow-straight, flat, and stretched endlessly into the dusty horizon. But on that horizon the snowy peaks of the Colorado Rockies eased into view. The high desert gave way to folded foothills. The oil wells disappeared. A few trees cast sporadic shadows here and there. The snowy peaks filled more and more of the sky. 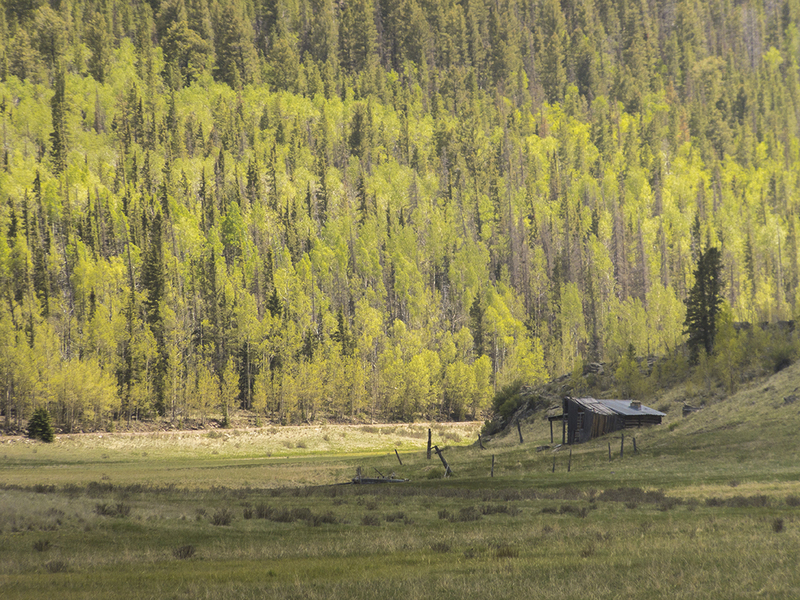 Savery, Wyoming–population 25–was somewhere up the road. The hills above Savery rolled like a stormy sea. We climbed, and we descended, for mile after mile. The mountains rose imminently before us. Oil rigs, fracking wells, and large tanker trucks were replaced by herds of cattle, ranch land, and trucks pulling horse trailers. Aspen trees dotted the scrubby hillsides. Midday heat bounced off the sandy road. Flies buzzed. “Savery, where are you?” I wondered. The town had no services. But a small part of me hoped for something—a shady spot next to a stream, maybe a gas station vending machine. When at last I coasted into the the settlement, my heart leapt with joy when I saw Ty sitting in the shade of the Little Snake River Museum drinking a Coke. “Trail magic!” he announced. The cool shade, Coke, and hospitality of the museum was refreshing. The Basin country was officially behind us. The border was only miles ahead. And the Colorado Rockies were just beyond that imaginary line in the dirt. But I didn’t really believe it. 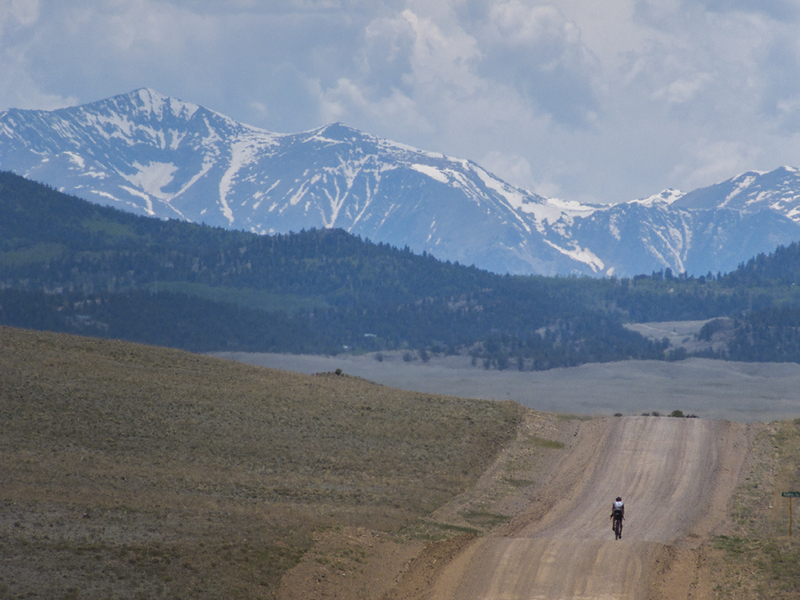 The overwhelming scale of the Tour Divide gnawed at me from the inside. We were just out here to get a taste of the real thing. And already I was tired, sore, and cranky. I wanted to go home. “There’s no way I can do the Divide. I can’t even pretend to do the Divide.” I left the museum behind wondering what I’d gotten myself into, and if there was any way to get out of it. The demons were in charge now. The scrubby foothills gave way to high alpine mountains. Deep timber forests and thick aspen groves covered the hillsides. Cloud-scraping peaks reached into the sky. Rivers and streams were abundant. A herd of elk grazed on the river bank, a fox scurried across the road. After days in open grasslands, the trees were a sight for sore eyes (and legs). The road climbed higher into the mountains, en route to our first high-altitude pass of the week. We stopped at a quiet Brush Mountain Lodge. Kirsten was still getting ready for the summer’s rush of bikepackers. We speculated about the upcoming race, thanked her for her hospitality, and moved upward into the mountains. Soon, we were pushing our bikes over the pass through sloppy snow. Thick clouds swirled overhead. Rain spattered lightly. Water flowed under the snow, a temporary river under the ice. I was more determined than ever to end the madness. I decided that when I got to Steamboat, I’d find a way home. The road into Clark is fast and smooth. Pleasant, even. After a quick resupply at the Clark Store, we fought traffic and headwinds on the highway into Steamboat. The storm had missed us. Rain jackets were stowed. Bellies were full. We’d made good time. I pulled up next to Ty. “You aren’t going to like what I have to say.” I told him. He was right. I knew that dropping out of a multi-day ride should never be a spur of the moment decision. “Always sleep on it first.” was advice I had been given on the Colorado Trail. And doing that made a huge difference. The sun was below the horizon when we arrived in Steamboat. We checked into a cheap motel and found a place to eat. I called home. As frustrated as I was, I knew I was not acting rationally. Even if I really was determined to quit, there was nobody to come and get me. At home, life was toiling away as it ever has. Nobody was too concerned about my internal struggles or wether or not I had made terrible life choices that had led me to Steamboat Springs, Colorado on gloomy summer night. I cleaned up my gear and my body. I slept in an uncomfortable bed. I argued inside my head throughout the night. And in the morning, I rode onward, still not convinced that I had any business pretending to be a Divide rider. Morning dawned bright and clear. We rolled easily through the country roads leading out of town. Ahead of us was Lynx Pass, a classic Colorado climb–not steep, and very long. We climbed through aspen forests, shaded alcoves, and into the heart of the Rocky Mountains. The riding was pleasant, as was the weather. “I know I can do this. But do I really want to do it?” I asked myself. In the days after the trip I did not want to think about the Tour Divide. But it was impossible not to think about it. I watched the blue dots of racers creep down the route. I watched Mike Hall set a new record. I watched Chris Plesko execute his ambitious goal. And I watched as others broke through personal barriers, doubts, and limitations. I’ve been one before. On the Colorado Trail. And knowing that my little dot was being watched by friends and family was a huge boon. And I know that in 2017 on the Divide, it will be again. We did not prove good at dodging. But the storm was lazy. It spit and spattered while we rushed up the long mountain climb. The higher we went, the darker the clouds became. When we reached the summit of Ute Pass, rain had started to fall. 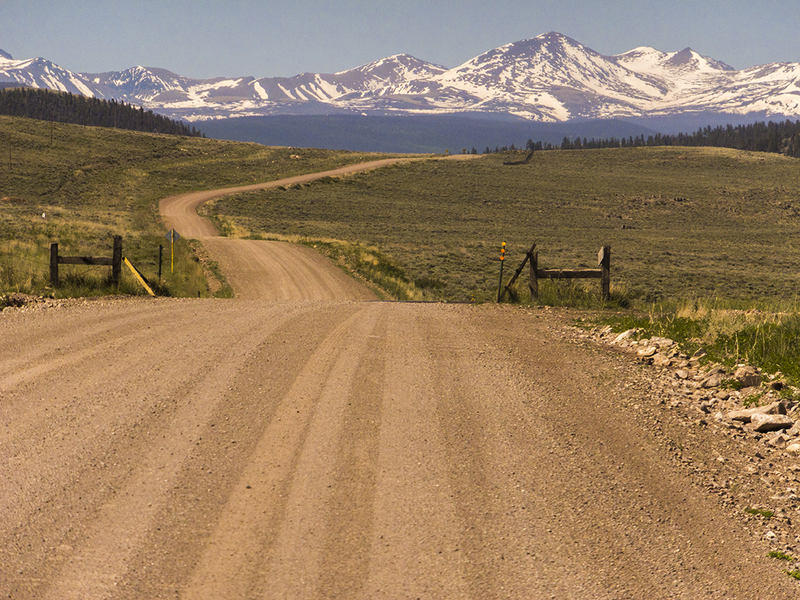 I shivered down the pass to Highway 9, hoping that Silverthorne was at the bottom of the road. Of course, it wasn’t. We still had miles of tedious, cold, and wet highway to mash through. It was getting dark. And more rain was falling. When we finally reached Silverthorne, the rain fell unchecked. We were soaked. We took refuge inside a Wendy’s. We could do nothing but laugh at the absurdity, and the luck. Had we been a little faster, we’d have been even wetter. Had we been slower, we’d be even wetter still. Somehow our pace put us in the small window of light rain, rather than the bookends of torrential rain that was now pelting the windows of the restaurant. That night we slept indoors, our ambitions of making it to Breckenridge put to rest by the storm, and tired, wet bones. The storm was gone. Pale light bounced off the snowy peaks. The cool morning air cut through layers. Traffic on I-70 hummed. We rode along the bike path through the tourist and ski towns. By the time we reached Breckenridge, morning traffic had already woken. Cars lined up along the 2-lane road waiting at lights, construction delays, and for places in parking lots. We resupplied at the grocery store. I like Breckenridge. And I like climbing Boreas Pass. We rose above the condos and town homes, and were soon well clear of the tourism and day-trippers. Snow still filled the shady drainages here and there. At the summit we paused for more eating. We skipped the snow-covered Gold Dust trail. Como came and went. So did Highway 285. Suddenly there were no mountains. No water. No trees. We entered the empty high deserts of Park County. “This is not the Colorado on the postcards.” I said. “No. No it isn’t.” Ty replied. Mountains surrounded us, but they were distant and faded. 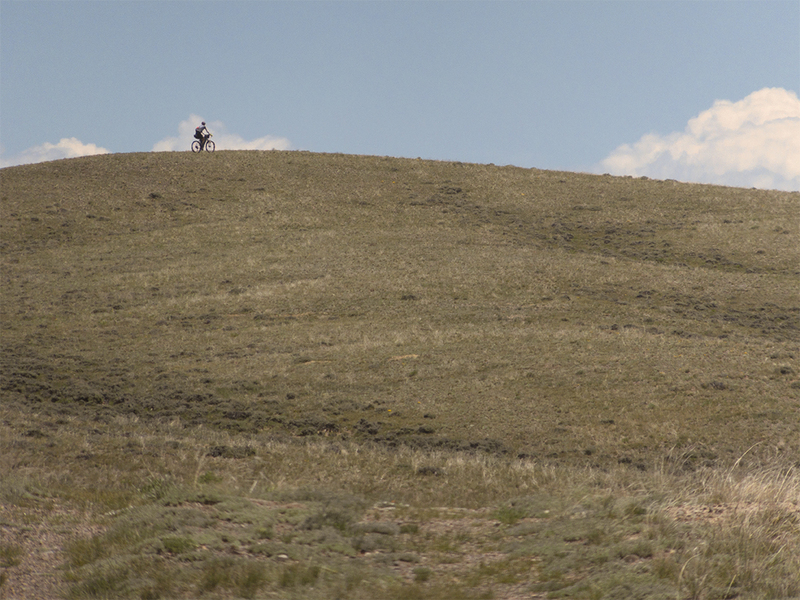 We pedaled through rolling hills covered in grassland, and stunted juniper bushes. Here and there a home stood defiant against the bleak landscape. Some of the homes were ruins. Others looked to be occupied part time. And others still had vehicles parked in the dirt driveways. Side roads splintered from the Divide route with names like Night Hawk Way, Owl Lane, or Surf Scatter Way. The place held a sense of lost opportunity, as if at one time it was supposed to thrive, grow, and become something more than the isolated living ghost that it was today. Mile after mile the landscape remained the same. Grassy hills, sporadic trees, and no water. Luckily the winds were in our favor and so we did the only thing we could do—pedaled. We rode past a sad playground, overgrown, and unused. A rusted baseball backstop, merry-go-round, and warped picnic tables slowly succumbed to the encroaching prairie. “Where would you sleep out here?” I wondered. After a while, Ty had disappeared up the road. I stopped to eat. This place was more oppressive than the Basin. It felt emptier somehow. As if something was missing. I mistrusted the invisible occupants of the homes. I felt wary at the rare passing vehicle. Unfair feelings, certainly. But the landscape felt untrustworthy and artificially remote. Hartsel offered some relief. Ice cream. Mountain Dew. A bathroom with running water. But we did not linger. We had more emptiness to ride through before we climbed back into the mountains above Salida. The sun still burned high in the clear, empty sky. Hours later Salida appeared at the bottom of the hill. We had climbed from the prairie, leaving behind the grasslands and strange emptiness of the long, long valley. Swaying aspen trees and huddled pines felt familiar and reassuring. The steep climb was a welcome diversion from the countless rollers and mind-numbing flatness of the days ride. Salida felt crowded and noisy. We cleaned our dirty bikes. We fed our dirty faces. “Are you alright?” Ty asked me. My hands were shaking. I felt dazed. We had made good time, however. And the rest and the food were brining me back to life. The sun was still above the mountains. “What do you want to do?” Ty asked. Storm clouds were swirling overhead. Storm clouds were always swirling overhead. We climbed the highway out of town as rain and wind began to fight for our attention. When we turned off the road and gained the dirt climb to the pass rain fell eagerly. We scurried into our full rain kits, and with no obvious cover nearby, we pedaled through the pelting storm. What could we do? We had made our decision, and were executing it. If the storm continued to worsen, we’d find a place in the trees to hunker down for the night. if it let up, we’d keep riding. Such is the life of a bikepacker. Summer squalls do not last long. Not always. And this one moved on impatiently. 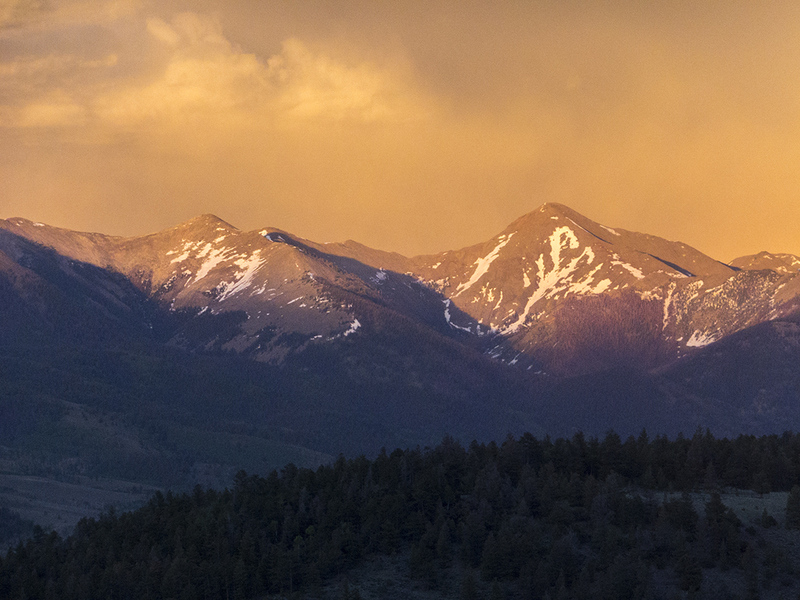 The wet trees still dripped with rain when the sun set over the Collegiate Peaks. Winter snow bounced off the summer light. Sticky clouds clung to the peaks, reluctant to move on with the storm. “This is why we do this!” Ty said. The long and dark descent into Sargents felt longer that it was. But when finally a faint light appeared in the night, we knew that we had reached our goal. The trading post was closed, and no human life stirred. We crawled into the teepee and shivered through the night. But we had ridden 160 miles. Not a bad day. The demon slept, though I did not. Only 113 miles separated us from Del Norte. I was not in a hurry to start moving. I dreamt that we had decided to end our ride in Sargents. When I finally crawled out of the teepee, the day already felt old. It was just after 7:00. The store would be open soon. I showered. Cleaned up a little. I hardly recognized the man in the mirror. “Just another 113 miles. I can do that.” I spent too much money at the trading post. But I did not regret that. The hot breakfast and the bottled smoothies were worth the upcharge. I shoved some candy into my bags, along with chips and more Mountain Dew, and finally started riding again. 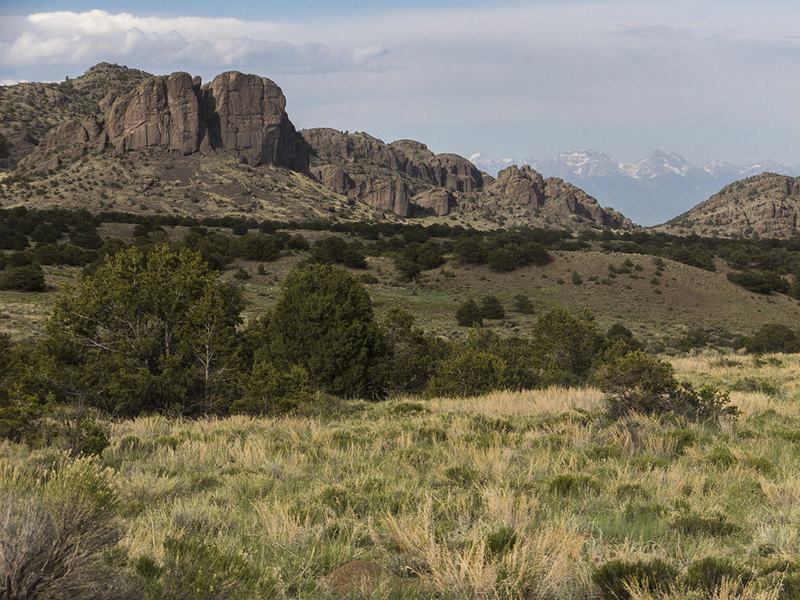 The Divide route in this region parallels the La Garita Wilderness detour on the Colorado Trail. The terrain leading up to that area is identical to the detour—rolling hills, mountain valleys, a few streams. The shade is shy and the sun, arrogant and bold. I didn’t like riding through this area on the CT, and I wasn’t looking forward to it today. But, the route is the route. And onward I went. “I will see you in Del Norte.” I told him. It wasn’t fair for him to have to wait for me. I knew he was growing weary of my pace. And my roller coaster attitude. He didn’t argue. Instead, he rode into the distance and disappeared. I sat down in the rare shade and assessed my situation. Plenty of food. Plenty of water. No injuries. Sore feet. And sore rump. “I’ll have to do something about that.” I told myself. Better shoes, maybe. A new saddle. More chamois cream. The road to Canero Pass was dusty and dry. I turned on music. The sun beat my back. Gravity tugged me backwards. The pass was up the road. On the other side, in the distant valley was the La Garita store. I started dreaming about chocolate things, cold things, salty things. But the incline hindered my way. “Just pedal. You’ll get there.” Nothing else to do. And that is one of the great and terrible truths of the Divide. There is nothing to do, except ride. It’s simple. It’s focused. But that simplicity can grow mundane. It can be tiresome. I reminded myself that most of what I do everyday is tiresome. A desk job is repetitive. I stare at the same screen, doing the same things. I drive the same roads to get there. Say hello to the same people in the stairwell. Solve the same problems. Life is mundane, most of the time. 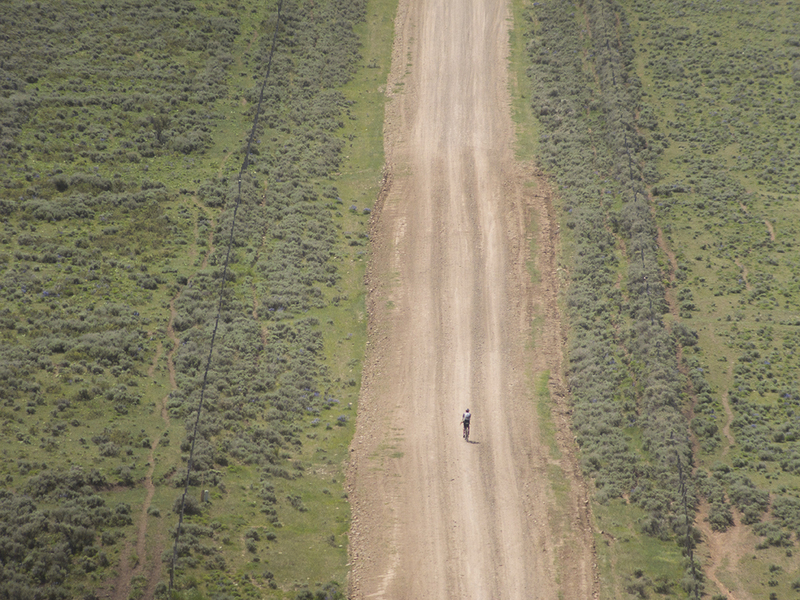 Riding across the Divide isn’t any different. Except, that it is. 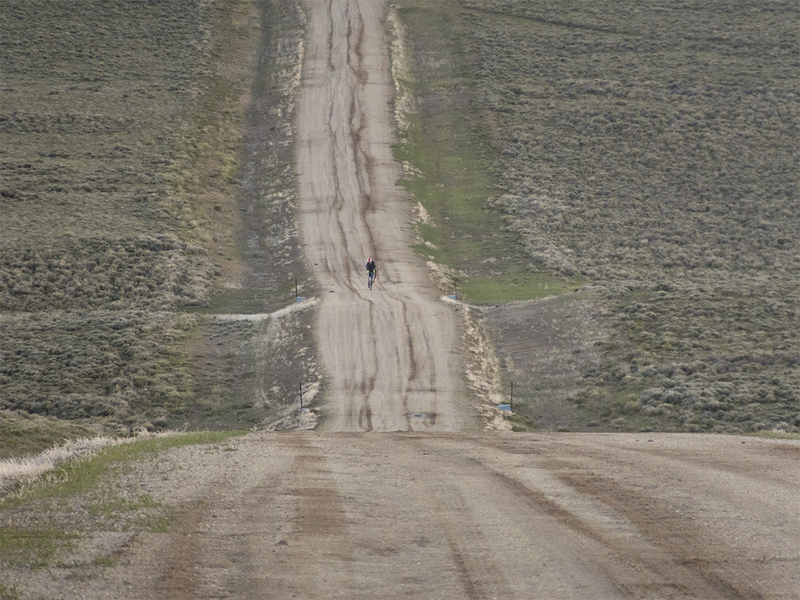 There is no paycheck at the end of the Tour Divide. Indeed, there is nothing but a lonely road and a fence. But it’s the place I want to arrive at more than any other. It’s the place I see in my sleep. And for what? Not glory. Not money. But for the journey itself. For the doing. Every day is an opportunity to do something remarkable. The grinding sameness that we allow into our lives is not mandatory. It’s not normal. It’s a choice. The demons that belittle me are not real. I created them. I fed them. And I can kill them. Racing the Tour Divide is a protest against the screaming majority that cries in unison for safety and security, misery and depression. I’ll be at the 2017 Grand Depart because what choice do I have? I know that if I am not there, then I will have failed. I will have let the conjured fears and anxieties grind me into dust. 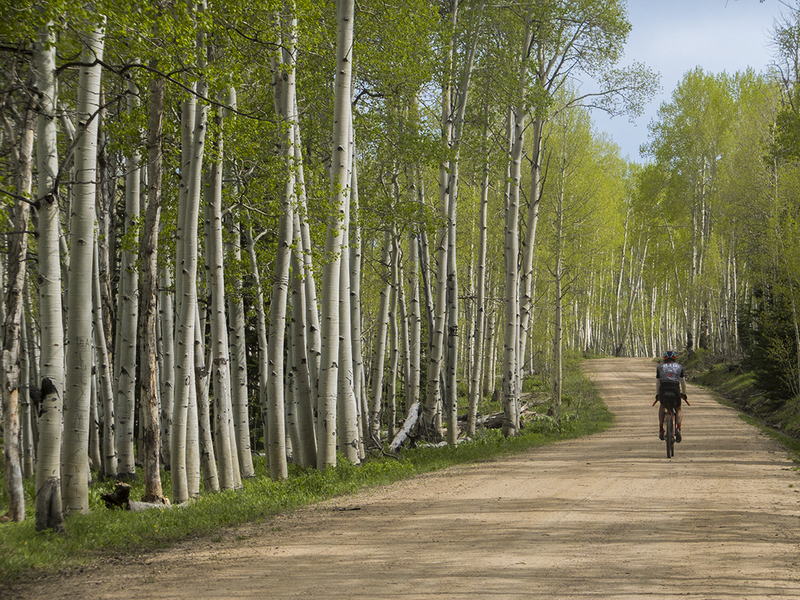 I will race the Tour Divide because it is excessive, indulgent, and absurd. But because it is also simple, primal, and necessary. Mankind needs more solitude. We need more time way from the gauntlet of “normalcy”. We need a cure for our addiction to productivity and growth and happy share holders. We need the Divide. It needs to exist. People need to show up every June and pedal through the thick forests full of bears and the empty deserts full of fears. As long as the Divide exists, there is hope for man. I hurried into the parking lot of the La Garita Trading Post. I was not disappointed. I was not sad. I screamed at the empty building. I screamed at my bike. I wanted to throw something through a window. Del Norte was 20 miles down the trail. A fierce headwind laughed in my face. No chocolate things for me. Only dust, warm water, and bitter bile. I pedaled angrily though the red-rock scrublands. The road was soft and dusty. The headwind persisted. The only stream was fenced off. “KEEP OUT NO TRESPASSING”. The route felt obligated and unnecessary. Del Norte was closer than the road made it. But we were routed into the hills so we could take a side trip to an arch. An arch? Who cares about an arch. I want ice cream. And a shower. An arch? My anger followed me into town. I sat on the porch at the gas station, indulging in all of the things I wanted in La Garita. I didn’t enjoy them. The sweet, cool ice cream was spoiled by the dusty bile and bitter anger. Ty was at the hostel. I ate more food, knowing that without it, I’d spiral further into despair. I’ve always known that someday I’d be on the Great Divide Mountain Bike Route. And here I was. And next year, I’ll be here again. Dinner and shower helped me feel better. They always do. But I was tired. And the tension between Ty and me was strung tight. Ty is a great bike racer, and a better friend. I did not want to damage a friendship that transcended bikes. But I needed to be done. “I’ll wait here in town for you tomorrow.” I told him. Our plan had been to climb out of Del Norte to Indiana Pass, then backtrack into Del Norte, where we’d be picked up. I was done, however. Ty didn’t say much about that. In the morning, he rose and rode. I sat in bed and wondered if I’d ever bikepack again. Days later I am still wondering if I truly am broken. Unfixable. And if I am? So what. Broken people ride broken bikes every day. Broken people do amazing things. Indeed, nobody is whole. We are all shattered glass. 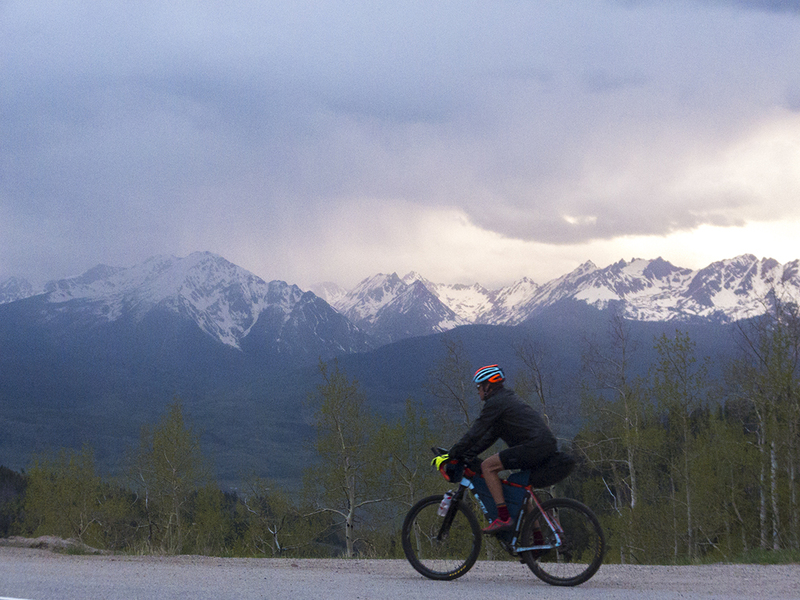 That’s why the Tour Divide is amazing. Normal people with normal bodies and brains find a way to finish the ride every year. They break a part, pick up the pieces, and ride on. I am more determined than ever. I’m also more scared than ever. But I am better prepared for the demons. I know what it feels like to spend days on the Divide. And next time, I will be stronger for it. Thanks for helping me see the demons in my journey. I love you writing. Chapeau! Well written Grizz! Guess all those miles helped you go fast at Crusher. Nice work! Great story, I love this part “Mankind needs more solitude. We need more time way from the gauntlet of “normalcy”. We need a cure for our addiction to productivity and growth and happy share holders. ” People always ask me why I like to isolate myself in the wilderness. if the route had more mountain biking, more *trail* instead of road, i think fewer people would ride it, but a larger % would enjoy it. quality over quantity? I love mountain biking. i hated the gdmbr. every day was a roller coaster for me, as for you. endless roads to the horizon do not scratch my itch for exploration or engaging with the world around me. they just make me tired, sore, grumpy. sounds like it was the same, or at least very similar, for you. these feelings do not go away when riding the full route. you know that. if anything they start sooner and intensify, knowing every day that you have a few more weeks to go. 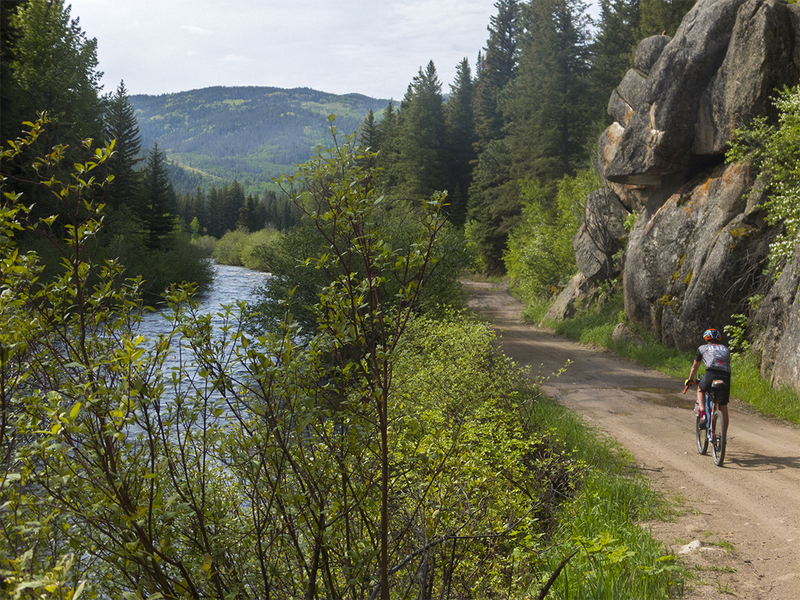 no shortage of trails out there to be ridden, or raced — if you must. maybe put some of your ambition into coming up with an alternative to the craptastic, uninspiring dirt-road route that is the GDMBR. someone should.